My birthday is this weekend so of course I’ve been doing some online shopping. You can’t feel guilty about treating yourself on your birthday, RIGHT!?! I found this red striped top and immediately thought it was cute and perfect for those chilly spring days and nights. I also love that it can be worn so many different ways. Below are a few ideas on how to style a red top. I love this look with the white pants for a casual day at work or for lunch on a Saturday. You have to love color to love this look, and I LOVE color. People are so afraid to mix red and pink but it looks so good together. Click here for some more pink and red inspiration from Pinterest. This look with the black shorts is perfect for a night out with your girlfriends or a date night with your significant other. The earrings pop with the red shirt and could be worn with any of the looks above. If I can leave you with one tip, its this: Don’t be afraid to mix colors. You will be surprised on how mixing colors brings a lot more interest to your outfit. Happy Wednesday! 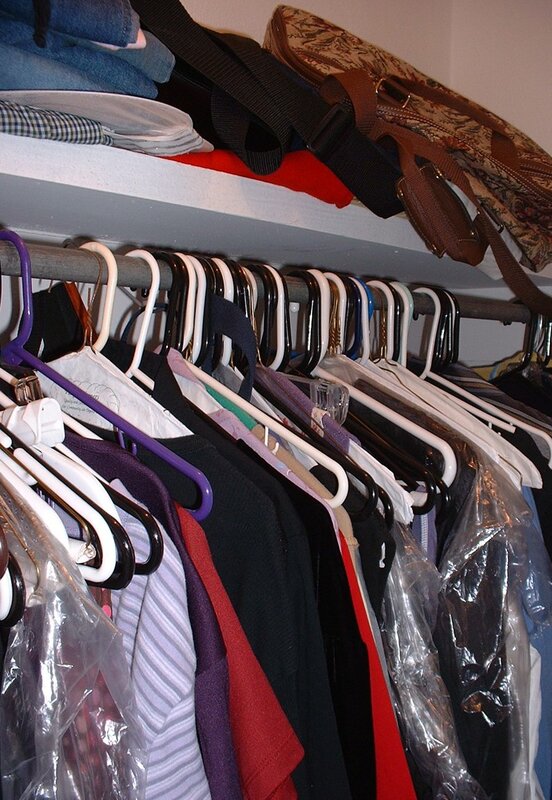 I would venture to say that most of our closets look like this picture. I know mine does at the moment BUT I’m about to get that under control. At least its one of my New Year’s intentions (we don’t say resolutions anymore in 2018). If you are like me, some mornings you stand in your closet and look at all of your clothes and think to yourself “I have nothing to wear and none of this stuff goes together.” The thing is, I can put outfits together with my eyes closed. HA! I kid, I kid. Seriously though, I do have that God given eye to put things together, especially when it comes to my beloved FASHION! It’s just hard to do it when your closet is a mess. This means we have to do something about it; because I’m going to go out on a limb and say most of you are like me as well and don’t have the money to buy a whole new wardrobe. First things first, CLEAN OUT OUR CLOSETS!!! Recently I read the book Unstuffed by Ruth Soukup and it changed my thinking and the way I started shopping. I highly recommend it! Currently, I’m reading 31 Days to a Clutter Free Life also by Ruth Soukup so that I can implement her tips in smaller increments. If you need some motivation to help you get organized, READ those books. Anyway, she mentions this quote by William Morris in both books: “Have nothing in your house that you do not know to be useful, or believe to be beautiful.” This is a mantra to live by…Soooo let’s get all the useless ugly out of our houses. Once we are organized and have all the items we love and that fit us well hanging in our closets, we can start to put outfits together. Today, we’ll start with that cozy sweater you love. It’s been really cold lately and warm sweaters have been my jam. I love the color of this sweater from Nordstrom. You can take a basic sweater like this from your closet and style it so many different ways. Wear it to a date night, out with friends, to work with a pair of slacks or to be cozy on the weekends. See below to get inspired on how you can wear that go to sweater in your closet with something other than a pair of jeans. Although a cozy sweater and your favorite pair of jeans never goes out of style.